Principal Learning – My journey as a learner and leader in K-8 education. It’s been almost an exact month since the first bell rang out to start the 2018-19 school year. It was my first journey back to a school after 2 years of working at a system level. Flipping the calendar to October is a great time to reflect on my first month in. School Start Up: What’s That Word? There is an energy that exists in a school start-up that’s hard to explain. I’m looking for a word describe it and I can’t yet find it. My wife and I live about 15,000 kilometres from my in-laws. We have great ways to stay connected. We phone, we Skype (note, this is now a verb), we follow each other on Instagram and Facebook. But my sister-in-law also uses Tinybeans, a closed sharing network designed primarily for parents to share moments in a child’s life with family and friends who can’t be along for the ride at every moment. It is also marketed as a means of capturing the story of your child’s ‘growing up’. ‘Canadian’ Uncle Peter and Auntie think it’s wonderful! While I was catching up on previous posts early this morning, there was a video ‘starring’ my 2 1/2 year old nephew. Here he is, as is pretty typical for a toddler, playing with buckets of water. He’s filling them; he’s dumping them. Sometimes, he’s watering the plants with them. He’s asking questions. He’s wondering things out loud. And, this morning, HE’S COUNTING THEM. OUT LOUD. AND WONDERING IF THERE ARE ANY MORE. Although this activity isn’t prompted, it’s immediately supported by his Mum. I capitalized this interaction because it is a terrific example of the perfect blend of play and learning. It’s self-directed but supported. It’s interactive and social. Mother and child are talking about water and buckets. But it could be anything. When my son was my nephew’s age, it was hubcaps. My brother-in-law and sister-in-law, along with their friends and family – both near and far 🙂 are a wonderful, knowledgeable support network. They will foster learning in this child (as well as his younger sibling and soon-to-arrive cousin) because they all recognize the importance of social interaction as part of learning. But not all children have this network. Not all children are surrounded by an accessible, knowledgeable and supportive adult group. And not all parents or caregivers have this knowledge base nor have the opportunity to spend this kind of quality time with their child(ren). This raised some questions in my mind. Questions to which I wish I had answers. So I leave it to you… Please comment, question, ponder or even answer some of these in the comments section. If the above-mentioned kind of ‘pre-school’ learning is important, what role can public education play to support a child’s early learning? How can educators get out into communities to work with new parents? How can education or early learning systems get to where they are most needed? Will a fostering of life-long learning in schools impact the next generation of children as these ‘life-long learners’ become parents and/or caregivers? When I go back into a school as a principal, is there something I/we can do to support the early learners in our community before they get to school? In my new role as F.S.L. Lead, I’ve read a lot in the first month about the acquisition of a second language. But while here in Paris, I have been reflecting on how I live with my first language and the implications that reflection has on how we learn, maintain and deepen language learning. I was born 50 years ago to parents who had recently moved from the Acadian Coast to Mimico for work. As my parents interacted with me, I imagine my early thought processes, my early problem solving, my formative synaptic connections happened in French. With French as their first and only language, they would have spoken to me, comforted me and scolded me ‘en français, s’il-vous-plaît’. My English came from the neighbourhood and the T.V. I am part of the original ‘Sesame Street’ generation. I don’t ever remember not being able to speak or understand both languages, but I certainly imagine that my languages developed somewhat simultaneously. How should I order my coffee? What does that mean on the menu? What is the correct way to ask that question? What is the difference between café, cave à vin, brasserie, pub and restaurant? Is there a particular daily paper I should get if I want to read my news from a particular point of view? …and numerous others. I have lived 50 years going through life as an English-using, white, Canadian male with a significant knowledge of French. My schooling, from the 2nd grade until the end of high school, took place in a newly emerging Ontario French school system. Yet I feel my anxiety level rise as I contemplate how to manage simple daily tasks in a language that is, in reality, my first. It causes me to reflect on what we ask our students to do in French classes every day. We want to provide authentic experiences. We approach language acquisition from an experiential as opposed to a technical starting point. That brings a practical purpose to learning. I think that’s a good thing. But are we recognizing that the cultural context, the non-French ‘vécu’ our students bring with them into our classrooms and schools might be as much a challenge to second language acquisition as the lack of vocabulary, syntax and grammar? We are trying to bring them with us on a learning journey. Are we recognizing that their starting point is going to influence how successful they are? Those who know me well enough know that my Saturday mornings (or Sunday mornings when hockey is not in session) are often spent as ‘learning’ mornings, perusing the newspaper, websites, Twitter feeds, Pinterest pins, RSS feeds and Facebook posts for thought-provoking ‘gems’. In the past, as part of this learning process, I have shared one article, blog post, video clip, etc… that caused me to stop and think. I typically shared this with my staff internally, with brief comments, and called them FFTF or ‘Food For Thought Friday’. On rare occasion, I have also posted them publicly. Moving forward, once per week, I am committing myself to a blog post. I will at times repost someone else’s idea with some of my own “Food for Thought” added in. At times, I will share tidbits from my own practice or ask questions about what I see or perhaps even challenge the status quo. I often talk about the importance of visibility in learning. I actively work at this and post information to my own school’s website and Twitter feed in the hopes of sharing that learning. I need to be much better at sharing my own. I spend so much time admiring and reading the work of online mentors such as George Couros, Donna Miller Fry and Brian Harrison that I forget I can be adding to the conversation. In his recent blog post, Richard Wells (@Eduwells on Twitter – click here for the post) challenges the status quo of schools, implying that the constructs of school (schedules, routines, assessment, learning activities, professional development, etc…) are not created for student learning, but for teacher facility and convenience. He embraces instead his definition of student-centred learning and highlights five actions schools could and should take to foster it. A couple of questions come immediately to mind. 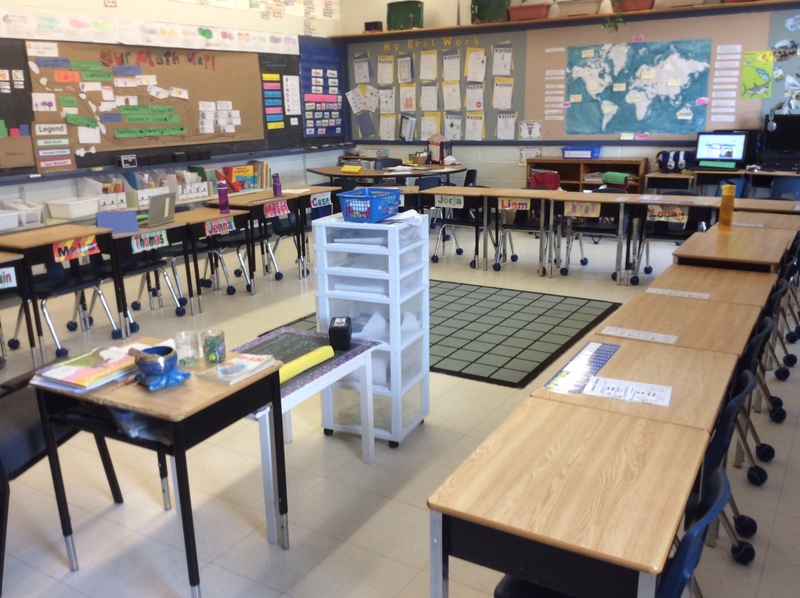 What would such a time(table) look like in an Ontario K-8 school? Do we have any that have successfully played with this type of flexibility? If 20th century schooling is to blame for a fixed mindset where conformity & control in school are the norm, that’s pretty deeply-entrenched. How do we change that? In early January, our school was part of a District Support Visit. After this visit, we were provided with a series of questions to focus on to further our journey of learning as it relates to our School Improvement Plan for Student Achievement. Staff were given an opportunity, during an activity called a ‘dot-mocracy’, to give input on where our school-wide learning focus should be. The activity revealed that staff would like to increase the amount of learning they do from each other. Today’s PA Day was structured to allow staff to ‘share their expertise’. The structure of the day is included here. As my ‘reflection’ piece, I’ve chosen to narrate about where I went, what I saw and how I structured my morning. I visited every room. And I went sequentially, starting in our tech room and ending in our Junior French classroom. There was only geography and methodology behind my thinking, walking from one classroom to another. I’ll post a sample from all rooms on another page and include the link but, for now, and although I learned something in every room, I’ll provide some highlights. I noticed that a blog post had already been started in Kindergarten. I noticed, and was quite inspired by, Kalin’s desire to not only post about his successes but also what he perceived as a lesson that didn’t go so well. The explanation of the start of the inquiry process gave me great initial insight into the Kindergarten learning environment. I also noticed the links to my own practice teaching Grade 7 & 8 history this year. I have tried my hand at ‘Je vois, je pense, je songe’. I saw what I perceived to be some ‘messy’ learning. 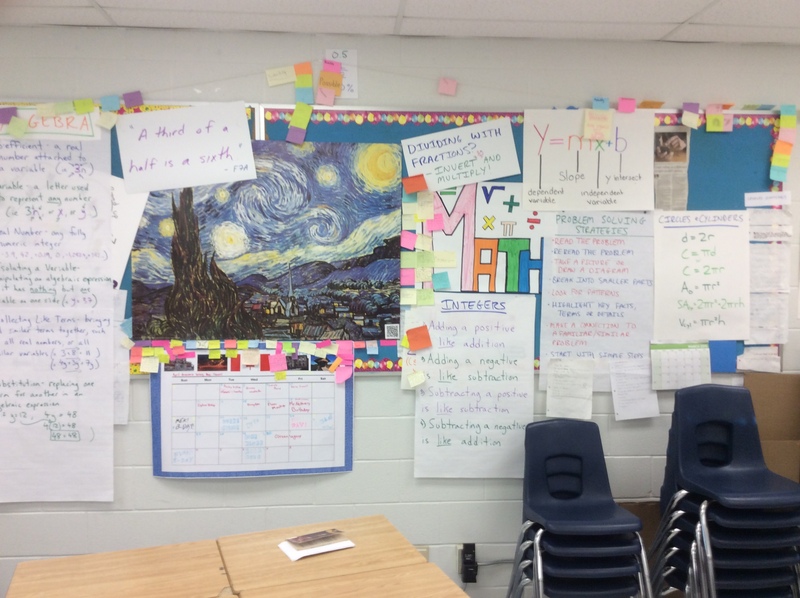 It highlighted for me that student learning can indeed get messy. I’m also guessing that is the best kind of learning for some of our students. The highlight of student voice and student product here highlighted that for me. 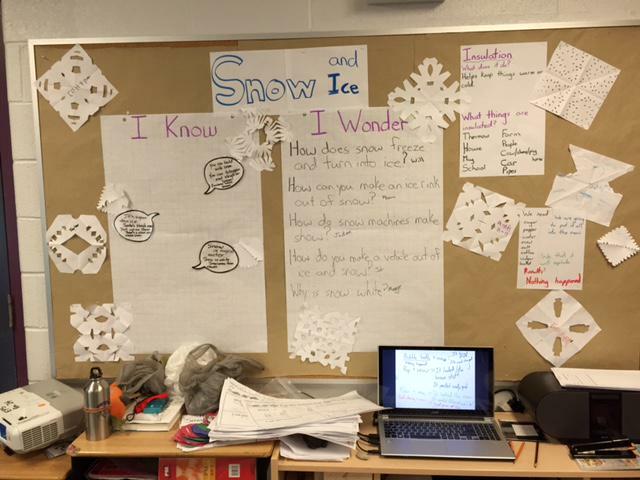 Student learning seemed evident right along side teacher guidance. I could imagine myself being successful in an environment that allowed my voice some visibility. I also appreciated process. Going through this classrooms was easy. The process of guided instruction in both Math and Language was laid out for me as if I was a student in the classroom. As a student, I was provided with tasks that helped me practice important skills independently. The purpose of each task was explained clearly. As the teacher, I knew what I would be doing at the guided reading table and what direct instruction for the small group of students would look like.